DIOSNA - for more than 130 years the name of the company from Osnabrück has been standing for highest quality standards in the field of industrial machines. After its foundation in 1885, focussed mainly on machines in the fields of agriculture and household machinery, its focus is on two special fields now: Food industry and pharmaceutical / chemical industry. The wide range of pharmaceutical plants made by DIOSNA reaches from the small laboratory plants to machines for the large-scale production. The solutions are created for various application purposes including the chemical and pharmaceutical sector, as well as the food industry and the cosmetics industry. On the basis of its DIN ISO 9001-certification, the company is continuously working on the assurance, documentation, and improvement of the existing quality level. The offered solutions cover all industrial processes. 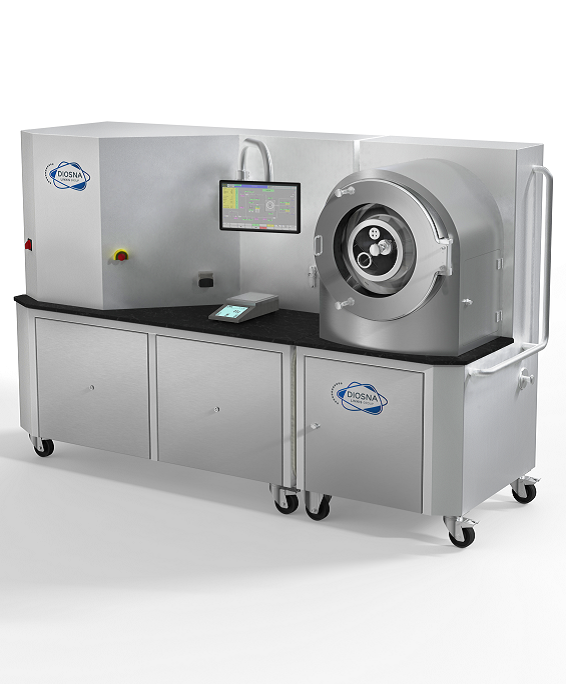 While pharmaceutical plants like the P/VAC - 10 focus on mixing and granulation, machines like the MIDILAB RC ensure the proper drying, agglomeration and coating of materials. Furthermore, DIOSNA is offering combined solutions that are able to do multiple steps simultaneously. 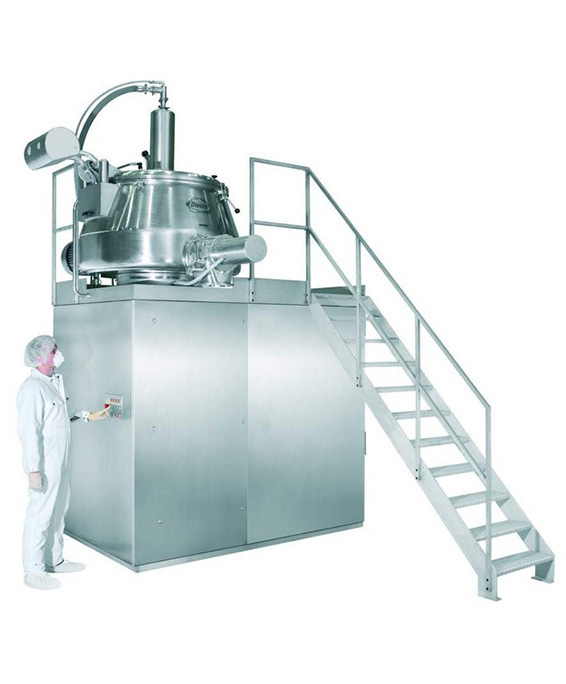 Because the pharmaceutical industry is performing production and research works, the size of the plants varies depending on the purpose of application. Therefore, modular laboratory plants, like the MINILAB RC, are suitable for development works in a small scale while production machines, however, are optimised for the large-scale production of pharmaceutical products. Three scales, three types of specialisation. The pharmaceutical mixers and granulators made by DIOSNA focus on the special demands of each department. The P1-6 allows the user-friendly production of dry mixtures and wet granulates in a small scale and turns out to be very versatile as table-top unit with easily removable bowls and touchscreen. The movable P/VAC - 10 is also very suitable and is the functional extension of the P1-6. The Pilot Plant Processor P/VAC 10-60 enables the flexible transfer between laboratory and large-scale production. As a full-featured production machine, it allows preparing and drying of granulate also in vacuum. Finally, a series of professional pharmaceutical machines is available for the production scale; they range from P300 to P1800 and with 300 to 1800 l they allow an efficient mass production. The DIOSNA Fluid Bed Processors perform a series of elementary procedures. Drying, spray-granulation, powder-coating and pellet and tablet coating can be processed in the small-scale as well as in the large-scale production. The MINILAB RC is designed as table-top device for research and development works and covers a wide range of tablet production. Comfortable operation, easy cleaning and high flexibility count to the advantages of the compact plant that has been designed for batches of 0.2 to 3.2 kg. Larger sizes are captured by the CAP 10-80 RC. It convinces with a flexible range of batches from five to 40 kg as well as an easy handling; this allows fast and very efficient change of bowls and operation. The most comprehensive systems are the Fluid Bed Processors CAP 150 - CAP 1800; they are equipped with graphical display and control unit realised by a computer or a PC-control, as well as further belonging components. These include, among others, granulation fluid bowls, cleaning stations, calibration mills, lifting columns and vacuum conveyor systems. 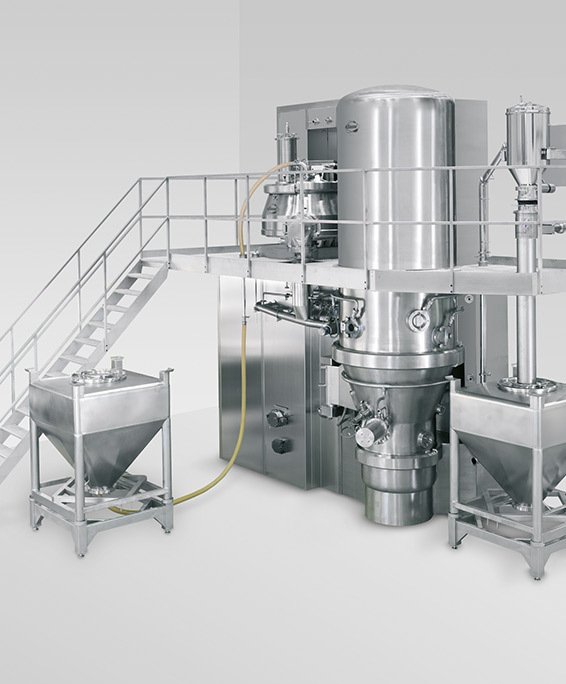 The solutions of the granulation line combine the functions of pharmaceutical mixers, granulators and fluid bed processors in one machine. The Granulation Line CCS 10-80 RC turns out to be space-saving whose control takes place through two control panels. Without tools, the two parts of the plant, i.e. 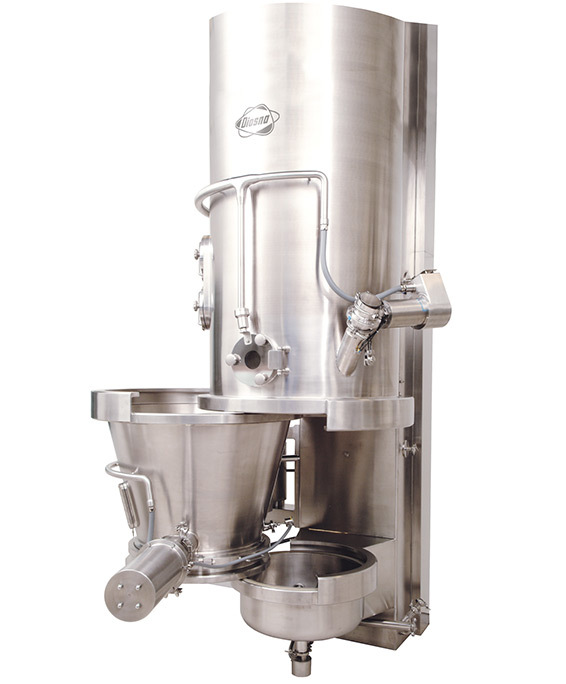 the Mixer Granulator and Fluid Bed Processor, can be equipped with various bowl sizes and in this way, they take part in the flexible adaptation to the respective process. Also the independent operation of only one component is possible. Further special qualities are the easy accessibility of all components and with this, uncomplicated cleaning. The same advantages are offered by the larger Granulation Lines CCS/CGS 150-1300 that have been optimised for big batches. In all lines, the innovative "through-wall" installation is used that ensures the strict separation of production and technical area. 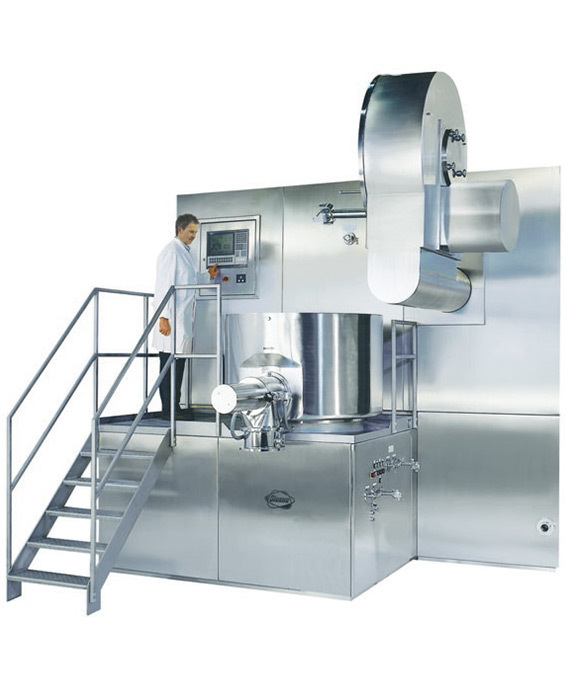 Besides the Granulation Lines, also the One-Bowl Processors are part of the multifunctional pharmaceutical series of DIOSNA. Homogeneous coating also on products with unfavourable flow characteristics; for this purpose, DIOSNA keeps numerous professional pharmaceutical plants available. The powerful and flexible MIDILAB RC is equally suitable for film and sugar coating. Their mobile housing encloses all units, has a useful work surface and a swivelling and tilting touchscreen for operation. While the movable MIDILAB RC allows batches of two to 16 kg, the fixed HDC (Horizontal Drum Coater) is suitable for batch sizes from five to 500 kg. One advantage is the drum design that facilitates the use for all types of tablets. As it is for all DIOSNA machines, easy cleaning and fast access to the function-relevant parts are further plus points. An alternative technology is the VCC (Vertical Centrifugal Coater): With the clear reduction of process times by up to 50 percent, it sets new standards referring efficiency and convinces with an especially homogeneous layer thickness. 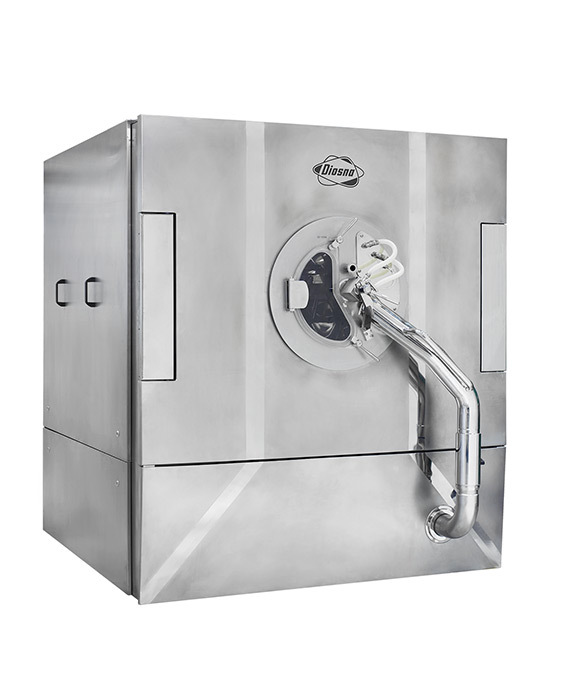 Thanks to the fully-automatic discharge the VCC is suitable for containment applications. 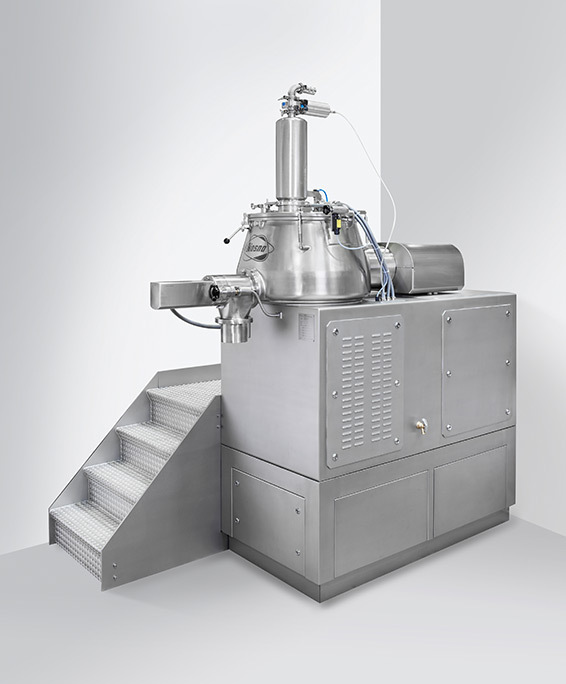 The range of application of DIOSNA pharmaceutical machines reaches wide over the pharmaceutics industry, as the Universal Mixer of the V 10 - 200 series gives proof. Their field of application includes the food, cosmetics and chemical industry. The production of spices and herbs mixtures, instant soups, and food for sportsmen is also possible like the production of dental mixtures, face powder, and eye shadow. The Universal Mixers V 250 - 1600 are designed for maximum batches and feature low construction despite their high performance. As „Pharma Experts“, DIOSNA with its continuous further development of its pharmaceutical plants provides for a maximum of efficiency, user friendliness and quality of final products. Without these highly modern machines, the pharmaceutical industry would be unthinkable related to the current standards. A view in the 19th century spells out the massive social progress due to chemical and technological innovations. At that time, medication was mainly produced by heavy manual work. On the one hand, this resulted in a small quantity for the population's needs; on the other hand in an always varying quality and with this the pharmaceutical products were not reliable. Today, the general public benefits from a variety of available medication whose quality is reliable and prices are relatively low. Mass production and continuous research are indispensable prerequisites for that. And therefore the company from Osnabrück delivers customised solutions to facilitate and the development and the production of new medication. The laboratory and production machines made by the company perform all industrial processes from granulation to coating that allow modern pharmaceutics. Pioneering spirit and seeking for perfection ensure that pharmaceutical plants of first quality „Made in Germany“ are created at DIOSNA also in future. Do you have any further questions about our pharmaceutical plants? Do not hesitate to contact us! Do you want to know more details about our product descriptions and pharmaceutical plants? Then contact us and we will be pleased to advise you in a component way and comprehensively about our product portfolio made by DIOSNA. We are looking forward to your inquiries!